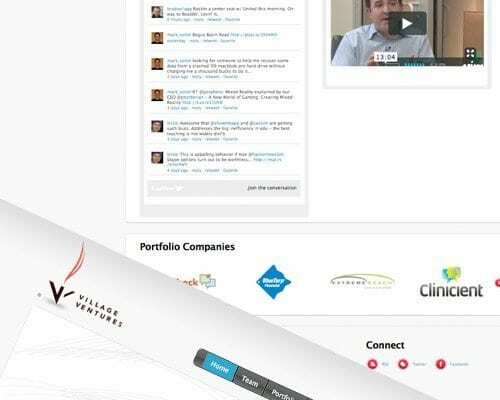 Village Ventures is a seed and early stage venture capital firm focusing on the media and financial services sectors. They partner with entrepreneurs creating innovative products and solving complicated problems in those industries. They needed a website to help them showcase their growing portfolio, their team of investment professionals, a network of partner funds, and other information vital to their visitors. Studio Two worked with Village Ventures to create a home on the web that showcases all that they have to offer. The website’s home page features a portfolio carousel, network Twitter feed, latest news and some featured videos.